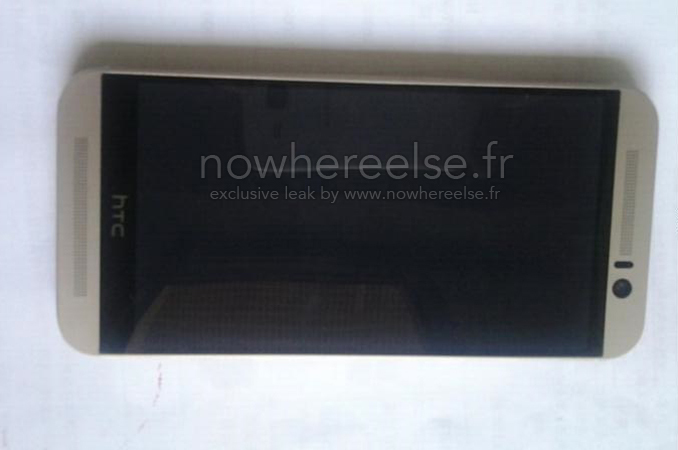 French tech blog, NoWhereElse, has got hold of these pictures alleged to be HTC One M9 aka Hima. Since these are leaked photos so we request you not to get your hopes high (or low) seeing this pictures. Nevertheless, the author was pretty confident about the photos to be M9. The first of the two pictures shows the front face of Hima or M9 which has got a familiar looks with nothing to drool about. But according to earlier leaks it is expected to retain its 5-inch full HD display just like its elder brother M8. However, the front-facing camera will be using UltraPixel camera technology. The bezels look a bit improved compared to M8 which will give a slightly higher ‘edge to edge’ display experience to its users. The BoomSound speakers are placed in its same old location but then again, according to Bloomberg, in M9 the BoomSound speakers will accompany Dolby audio. The second photo is where the interesting part is. Yes, it is that big camera at the back. Although the photo has been taken in such a way that there is no way to get assured if the M9 will succeed the Duo Camera setup but anyway, the rear-facing camera is something we are really expecting to be extraordinary. According to Bloomberg, the M9 will be boasting a 20MP rear camera with dual flash visible on the left; the camera is also seen to be square in shape. Other than today’s leaked image, there have been some information leaks of HTC One M9 which said the device will run by Snapdragon 810 chipset with Adreno 430 GPU supported by 3GB of RAM. Android 5.0 Lollipop is expected with HTC’s Sense 7.0 preinstalled in M9. And finally, Hima will be powered by 2,840 mAh battery. Since the unveiling of HTC One M9 is set on March 1st so rest assured that there will be more leaks ‘inbound’. What’s your opinion regarding the leaked images? What is your expectation of M9? Feel free to shoot your response below in the comments section.